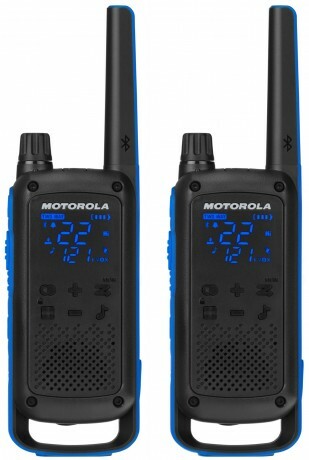 From the description and the picture, this Motorola T800 appears to mix a UHF service (GMRS or FRS) with a VHF service (probably MURS). As far as I know, the FCC rules are set up to prevent these two services from overlapping in one device, similar to the situation with Baofeng radios that combine Amateur bands and GMRS in one device. They cannot be part-95 type-accepted, and are therefore illegal to manufacture or distribute in the US. The FCC has recently threatened to go after companies that manufacture and/or sell these non-type-accepted devices. Motorola Solutions is both the OEM and the sales channel, and so I expect that they will really take gas for this.